2011 Victory Vision 8 Ball. Picture credits - Victory. Submit more pictures. 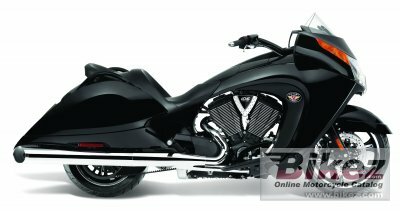 The Victory Vision 8-Ball is a one of a kind distance cruiser with unmatched handling ability, centered on a CORE technology� chassis that gives you as much confidence and control in the curves as you need without sacrificing comfort. Price as new (MSRP): US$ 17999. Prices depend on country, taxes, accessories, etc. Engine details: 50 degree V-Twin. self-adjusting cam chains, hydraulic lifters. Driveline: Primary Drive: Gear drive with torque compensator. Final Drive: Carbon Fiber Reinforced Belt. Front brakes: Double disc. Dual 300mm floating rotors with 4-piston calipers. Linked. Seat height: 622 mm (24.5 inches) If adjustable, lowest setting. Ask questions Join the 11 Victory Vision 8 Ball discussion group or the general Victory discussion group. Bikez has discussion forums for every bike. View comments, questions and answers at the 2011 Victory Vision 8 Ball discussion group. You can sign up for e-mail notifications when other riders answer you. If you have extensive experience with the MC, please send us a review. If you consider buying this bike, you should view the list of related motorbikes Look at photos. Compare technical specs. And check out the rating of the bike's engine performance, reliability, repair costs, etc. You can compare the rating with other bikes.